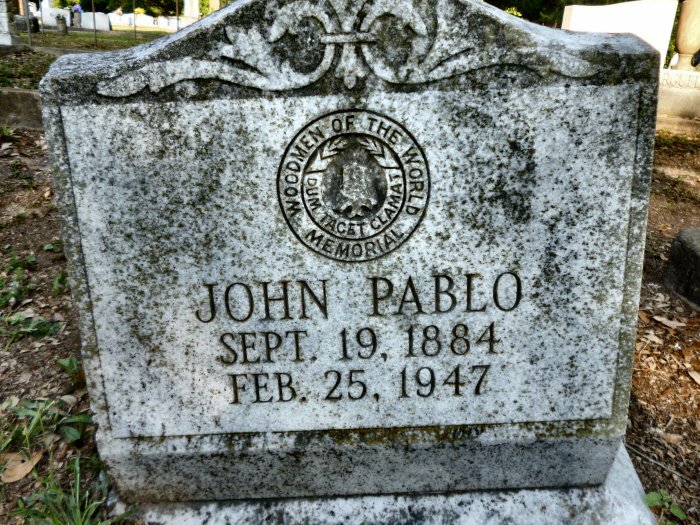 Joseph Pablo (1833-1905) was a native of Spain and an 1848 immigrant. Circa 1864, he married Anna Sanz (1850-1911), an 1851 Spanish immigrant. 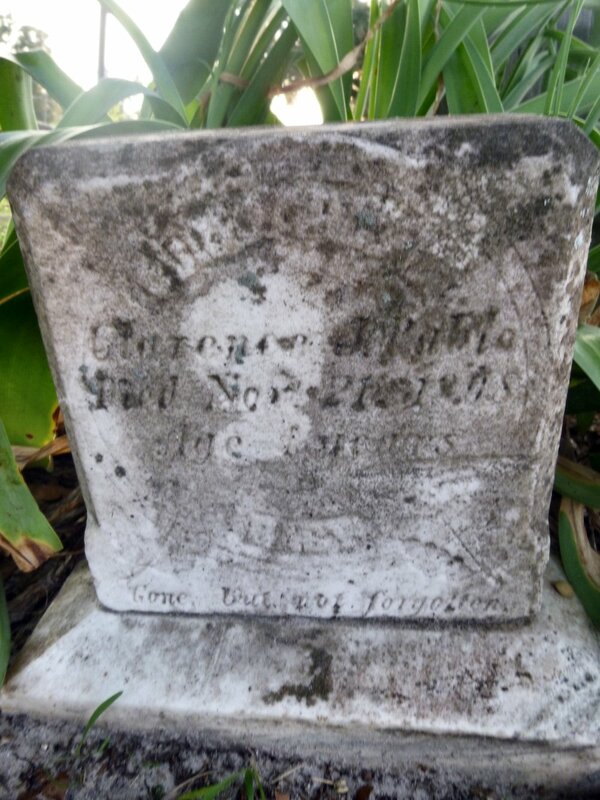 It appears that this couple married at New Orleans circa 1864 and had eight children born at New Orleans before 1900 of which six were living at this time: Josephine Pablo (1868-1938); Joseph Pablo (1869-1932?) m. Amelia Campos (1877-1919); Michael Pablo (1872-1904); Richard Pablo (1882-1902); John Pablo (1884-1947); Angel or Agnes (1888-1902); and Clarence Joseph Pablo (1904-1908). Josephine Pablo(1868-1938) was born at New Orleans on December 5, 1868. She never married and expired at 418 Copp Street, her residence in Biloxi, on March 11, 1938. Joseph Pablo (1869-1932?) was born at New Orleans on August 20, 1869. He married Amelia Campos (1877-1919), the daughter of Bernardo Campos (1842-1892) and Marie L. Morano (1851-1917). Their children were Noreta Lucile Pablo (1901-1994) m. Philip P. Dellinger and Earl ‘Blackie’ Pablo (1910-1985) m. Madeline Borries (1912-1999). Noreta Lucile Pablo (1901-1994) married Philip Paul Dellenger (1899-1979) in Harrison County, Mississippi on July 27, 1921. Their children were: Noreta L. Dellenger (1922-2009) m. Jack V. Besst; Philip P. Dellenger Jr. (1924-2009) m. Edith Jane Kennedy (1924-2012); Leonard Dellenger (b. 1927); Kenneth M. Dellenger Sr. (1929-2009) m. Joy Wyndham (1930-1993); Stanley C. Dellenger (b. 1932) m. Mary Evelyn Anglada. The Biloxi Daily Herald, “City News”, April 26, 1900. The Biloxi Daily Herald, “City News”, July 18, 1902. The Biloxi Daily Herald, “City News”, July 19, 1902. The Biloxi Daily Herald, “Found dead”, August 19, 1902. The Biloxi Daily Herald, “Necrology-Joseph Pablo Sr.”, March 28, 1905. The Biloxi Daily Herald, “Generous Officers”, June 24, 1905. The Biloxi Daily Herald, “Clarence Joseph Pablo”, November 21, 1908. The Daily Herald, “Mrs. Anna Pablo”, December 23, 1911. The Daily Herald, “Emily Compas [sic]”, January 6, 1919. The Daily Herald, “Miss Pablo dies”, March 11, 1938. The Daily Herald, “John Pablo dies”, February 26, 1947. The Sun Herald, “Noreta Lucile Dellenger”, October 14, 1994. The Sun Herald, “Philip Paul Dellenger”, June 29, 2009. The Sun Herald, “Kenneth M. Dellenger Sr.”, July 12, 2009. The Sun Herald, “Edith K. Dellenger”, November 26, 2012.